Happy New Year dear readers! Ms. Jeannie hopes that all your holidays were full of joy and cheer! May this year be even better and brighter then the last. Always at the start of January, Ms. Jeannie likes to take some time to reflect on the previous year and think about the new year ahead. So she whipped up a batch of cinnamon nutmeg scones, poured a cup of coffee and contemplated all that she had encountered in the past 365 days. 2012 was a turbulent year for Ms. Jeannie, containing both exhilarating highs and devastating lows. She said a long, sad goodbye to her dear old border collie as well her 97 year old grandmother. She said a cheery hello to her Etsy shop and to all you lovely blog readers. This was the first item Ms. Jeannie sold when she opened her shop! 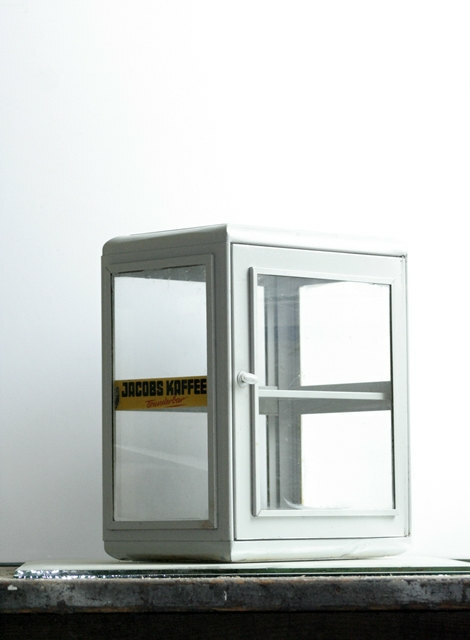 A vintage Jacobs Kaffee metal cabinet. She gardened, she cooked, she entertained. She battled a severe case of poison ivy, she learned a new craft. She served as nurse maid to her father when he fell and hit his head. She drove her husband to the hospital when he bled (enough for 15 stitches!). She babysat for chickens in the spring , spent the summer reading 50 Shades of Grey and the Autumn months watching all seven seasons of Gilmore Girls. She traveled to Phoenix, Atlanta and Palm Beach Gardens. She went on sightseeing adventures in her neighborhood and got lost in daydreams in her own backyard. She met a wonderful new pen-pal named Amy (thanks to the blog) and enjoyed a bevy of date nights with Mr. Jeannie Ology. She discovered Lindbergh and the most popular female author of the 20th century. She worked on family history and interviewed a bevy of talented craftspeople. Yes, indeed. 2012 was a year of romance and tears, love and loss, discovery and exploration. It was life. And Ms. Jeannie was thankful to be included in it. In 2013, she hopes to travel more, write more and learn more. She’d like to adopt a dog, plant a moon garden and sew a quilt. She’d also like to pick up her paintbrush again, make a mole sauce and sample all the wines of Spain. And more yoga. And the ability to master meditation. Oh and there is that bit about being better organized. And better at managing time. And she’s really, really looking forward to sharing more vintage adventures with you! For the times to come I wish for love to surround you, hope to strengthen you, peace to comfort you and overwhelming joy. Happy New Year! Next Ms. Jeannie Joins Pinterest! What a wonderful summation of 2012! Sounds like a full life. Now on to 2013. As Dr. Seuss would say “Oh, the places you’ll go!” Can’t wait to read about more of your adventures. Oh thank you Cindy! Suess is right, isn’t he? Oh the places we all shall go. What’s in-store for you this year?